I remember all too well the day I got saved. It was in a room. And I was alone. I was reading my Bible and all of a sudden, it hit me. I AM A SINNER. I understood then that I had not merely been “naughty” or “misguided” in my ways, I was utterly foolish and condemned. I saw the wretchedness that lay in every sodden layer of intricate me. But I saw the hope that lay in belief. I had heard the gospel over and again, I was the “church girl” yet it didn’t make sense to me. But that day it did. It hit me with the force of a thousand ton bricks. There was a shaft of light. It wasn’t blinding or anything physically profound but it was LIGHT. I felt sad and joyful. Confused and enlightened. Hopeful and discouraged. But even as these vortex of emotions suffused my heart, there was one clear thought I kept transmitting to a God I hoped was listening: I’m sorry. But once again, God has done what he does best for me; crumbling all my knowledge and confident understanding and replacing it with his. I have been very interested in this topic for quite a while now because I thought it didn’t really make sense (at least what I thought it was) – I cry and make promises to God and He is willing to pat me on the back and say, “It’s alright kid. Those tears should do.” It didn’t quite add up because eventually, the tears will dry and the action for which I made apology will inevitably be repeated. Then, I’d fill Heaven’s reservoirs again to be tossed back into the vicious cycle. It just didn’t seem right. But at last my search yielded some results I thought could be bought at least. 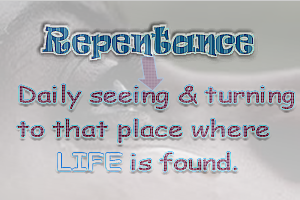 Repentance: It comes from the Greek word metanoia which means “change of mind”. Repentance is not regret: Regret is feeling sorry for one self and the consequences of one’s actions. But not necessarily making a change. Repentance is not remorse: Remorse is a feeling of sorrow and disgust. It eats its heart out without seeking a new one. Repentance is not reformation: Reformation is changing ones way of life, it may follow, but should never precede repentance. Repentance is not reparation: Reparation/restitution is practical proof of the reality of repentance. It is not repentance. Repentance is a changed way of looking at things. It is a shock that comes from seeing reality. It is a full realization of God and our dependence on Him, a revulsion against sin, resulting from a revelation of the righteousness and love of God brought about by the Holy Spirit. It is like an “earthquake” to the soul”, a revolution. Repentance is by God and from Him. It is not self-infused somberness or remorse. Repentance is RECOGNITION and REVERSAL. The recognition is not born of emotional self-derision or pity but of a higher reality and a higher calling. Reversal is absolute and in 1800 reverse, in full speed. Repentance is not a once in a lifetime thing – when you get converted. It is a daily attitude. Repentance is on-going. A continuous realization and turnaround. The Holy Spirit is the major player in repentance, without which God can hardly do anything profound in our spiritual lives. It is the beginning and end of an effective walk with God. It is the beginning of God's molding us into Him. God is not just some being trying to get us to live right but someone who longs to have a right relationship with us. Yes, it's a commandment but repentance should be entered into freely. There can be no repentance if there is no turning back. Still, there is no point in doing the right things unless one is sorry for the things that have drawn us away from Him or we become moralists; all good works and no heart. “Then I said, ‘It’s all over! I am doomed, for I am a sinful man. I have filthy lips and I live among a people with filthy lips. Yet I have seen the King, the Lord of Heaven’s Armies.’”(Isaiah 6:5 - NLT). Yes, repentance is crying. But it is not vain tears born of self-imbued remorse, no, it is one which cleanses our eyes to see how dependent and far off we are so we can turn from the failings of our ways to a greater calling. It is crying born of a divine reality not of self-pity. It is daily, seeing with the heart and not just the head where LIFE is found. So, how do you cry?